Die Statistik zeigt ein Ranking der weltweit bestverdienenden eSports-Spieler bis August 2018. Der Este Clement Ivanov (Puppey) gewann bisher ein Gesamtpreisgeld von rund 1,95 Millionen US-Dollar. 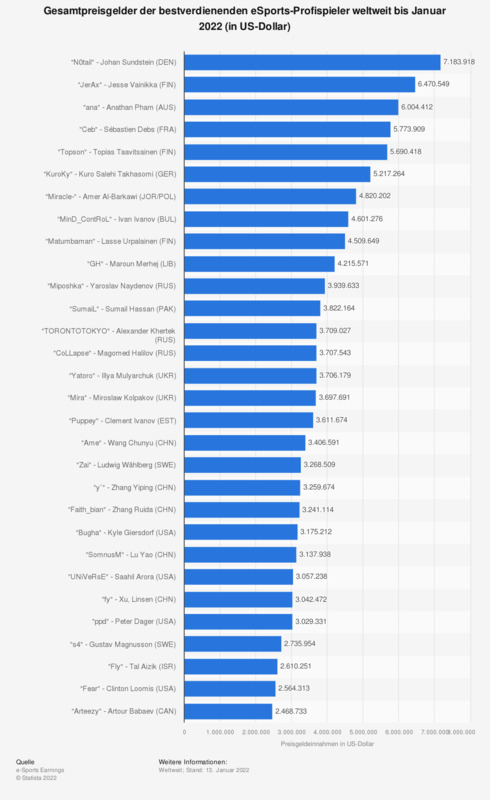 Die Quelle macht folgende Anmerkung: "This list represents the top players who won the most prize money based on information published on the internet. Sources include news articles, forum posts, live report threads, interviews, official statements, reliable databases, VODs and other publicly-accessable sources that preserve "historical" information".